Another day, another stat, another shocking image. We all know waste tide needs to turn. I feel the pressure as much as anyone. Maybe more so, when I am so accountable for contributing to the problem on a daily basis. 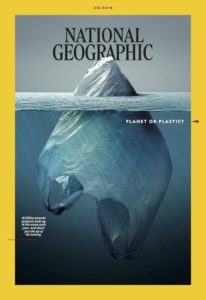 Designers create the packaging that creates trash (and not just packaging)…We know we’re a big part of the problem. But we also have the ability to help solve it. And that is the challenge we now need to step up to. And we can do this by being lightweights about waste. Not the contradiction in terms that you may think it is. None of us has the time to keep speculating and pontificating. But, ‘sustainability’ as a term and an idea is becoming trite, over-used, too complex and – dare I say it – meaningless. Sustainability shouldn’t be the intangible thing that it has already become but an essential part of what it means to be a progressive, relevant and attractive brand today. We want to create a new kind of longevity for our brands and products with what we are calling a ‘Lightweighting’ approach where we are committed to designing out plastic and excess material and designing in intrinsically lightweight practices and materials which reduce negative impact by minimising waste. This is about design making a reductive impact. We are not just changing the terminology, or dressing up the problem in a new way, but feel that we can use our expertise to establish a more active and interactive way to help brand owners understand the design possibilities – and aspire to make real, positive and desirable design change for the future of both their brand and the planet. Of course, we don’t have all the answers yet. No one does. If I’m honest, it’s an increasingly complex – but exciting – challenge – as we explore and learn. But we are committed to finding tangible and inspirational ways to educate and bring our new approach to life for our clients and to take it to the wider world. And nothing could be more real than an installation at the world-famous RHS Chelsea Flower Show. 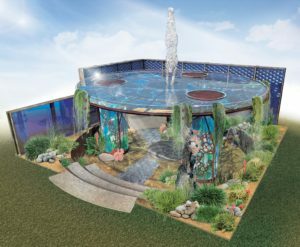 On 21st May 2018, we will be unveiling The Pearlfisher Garden – an immersive, experiential and creative garden highlighting the threat of plastic waste to the world’s largest garden – the underwater garden of our great oceans. It will feature a combination of natural elements set against a wall of 500 water bottles which symbolise the amount of plastic that enters our oceans every 2.5 seconds. A central 3D-printed sculpture of a Pearl Diver – or Japanese Ama – made from recycled PLA plastic, specimen planting including cacti, succulents and exotics will creatively juxtapose the beauty and possible desertification of the world’s most precious garden. The Pearl Diver is a great example of lightweighting as we have used plastic from factory waste streams, as opposed to virgin pellets. Her mesh structure – depicting the forms of plastic waste found in the ocean such as flip-flops or bottles – means we have reduced the amount of plastic used to print the sculpture by more than 50%. The Garden aims to be a powerful call to action for brands, businesses and designers to create lightweight life-cycles for the packaging and products of the future and for people to rethink the impact of their own consumption, and will have a long after-life when it is relocated to a public space for broader public enjoyment. Personally, I feel we all need to become heavyweights when it comes to fighting waste and start using the power of design thinking to start lightweighting our future. How can beverage brands unlock a non-alcoholic future?